Christopher Brown: Reasons I use Evernote? Unlike a brain however you are able to back up Evernote which removes the brain as the single point of a failure. Between IFTTT, a Scanner and the Document Camera: you are able to collect and archive nearly anything. E.G. receipts, statements, records etc. All stored safely within Evernote for easy access using search and availability everywhere with internet. My official photo album isn't evernote but often there are photos taken that just don't fit into a photo album paradigm. These photos are often of DIY triumphs or things you want to remember like my in the scrapbook example one above. Project PlanMy biggest active use of evernote is to get things done through todo lists. A todo list is only as good as the one you have with you when you need it! But now for a confession: I have never read David Allen's book on GTD. However I do read many blogs and listen to loads of podcasts featuring people who have. So don;t hold this against me in future posts.... Thank you!!! I am not going to talk about the benefits of writing a journal for that see this Lifehacker article, just that you can use evernote to achieve it. Storage of files isn't evernotes primary purpose lets leave that to dropbox and Google drive, however for archiving of files it is perfect, especially for files evernote can OCR. No internet connection means no access to my brain. Fortunately Evernote Premium allows for offline notebooks. 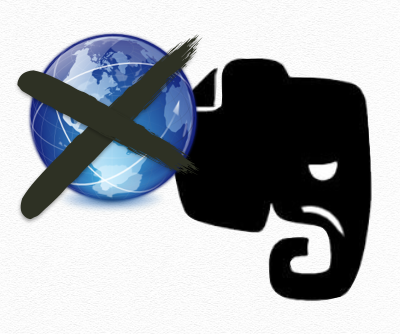 If Evernote was to go out of business tomorrow my world would collapse. Some might say this is an over reliance in the Evernote service. However in mitigation of this risk I have paid for the premium subscription. It is my way of doing my bit so they do not go out of business. Evernote doesn't encrypt data at rest: This means that the data going to and from evernote is encrypted but once received it is saved in the clear. No problem all the time the physical and logical walls to their data center(s) hold up. This decision means that evernote will never be suitable for use at my current place of work or for storage of any sensitive documents. Lastly, An artist always starts from a blank canvas. Unless he knows what he is going to paint the canvas will remain blank and useless. So much potential but often the first strokes are the hardest. Evernotes flexibility is its biggest asset but it can be its biggest barrier to beginners. Harnessing the power of technology to improve our quality of life.